Let us commemorate the International Migrant Workers’ Day on 18 December 2014! In 2014 we celebrate the fifteenth International Migrant Workers’ Day (IMWD). The United Nations Organisation declared 18 December as IMWD in 2000. Since then many states in the world, especially countries of origin, celebrate this day dedicated to migrant workers. The great contribution of the migrant workers to the world economy is recognised and the United Nations emphasises the protection of their human rights. Migrant remittances have made a great contribution to the foreign exchange in a country. According to the World Bank reports South Asian region receives USD 111 billion as remittances annually. At present the principle contributor to Sri Lanka’s foreign exchange is migrant remittances. It amounts to USD 7 billion per year. Consequently, specific steps have been taken in our country to provide a better future to migrant workers and to protect their rights. However, the discrimination and the suffering faced by the migrant workers have not ceased significantly. The plight of the women migrant workers is crucial in this context. In Sri Lanka, a majority of migrant workers are women who are mainly from rural areas. They are compelled to migrate for work to support their families who are affected by entrenched financial problems. This year we celebrate the IMWD at a time the country is preparing for a presidential election. 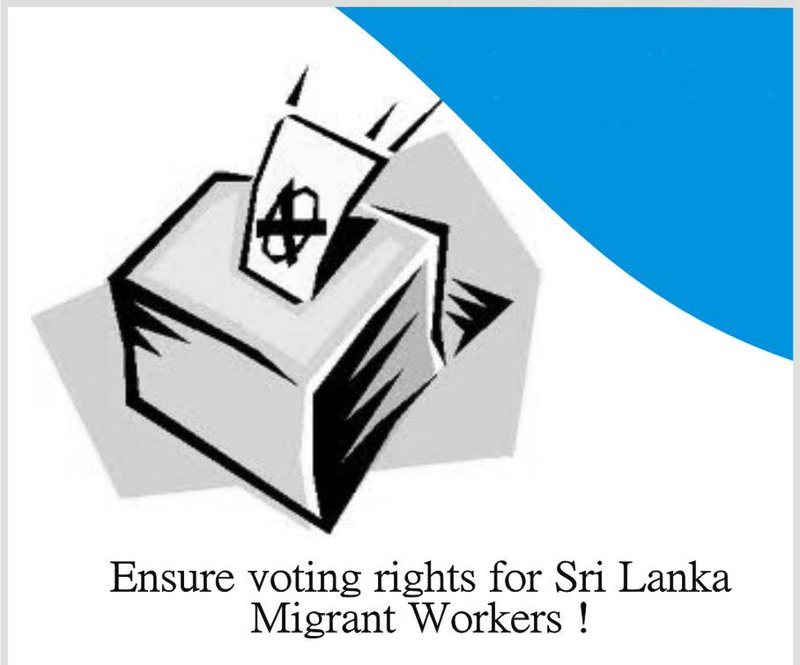 Although many migrant workers from other countries enjoy voting rights, Sri Lankan migrant worker community do not still have that privilege. Political parties and the politicians do not possess any inclination with regard to this idea and it is evident from their silence on the matter in terms of their manifestos and public speeches. In the previous elections also no candidate made any remark about ensuring voting rights of the migrant workers. Universal Declaration of Human Rights (UDHR), International Covenant on Civil and Political Rights (ICCPR) and International Covenant on the Protection of Migrant Workers and their families (ICMW) have guaranteed the voting rights of migrant workers. But over a million of internal and external migrant workers of Sri Lanka have been deprived of their right to vote and select a leader of their choice despite their voting rights stipulated in ICMW, due to the lack of necessary legal and implementation framework put in place by the government. Sri Lanka’s constitution stipulates voting rights to all the citizens through article 4 which mentions any citizen over 18 years of age is entitled to vote. However, there is no legal framework established according to the recent electoral laws to facilitate the migrant workers’ right to vote. Providing voting rights to the migrant workers who contribute immensely to the country’s economy is a state obligation; even by amending the electoral laws and introducing new laws. This large group of migrant workers entail a considerable percentage in the voting register. However, it is clear that none of the ruling governments so far have taken any interest in guaranteeing voting rights to the migrant workers. In the instance if the migrant workers are facilitated to vote at every opportunity to select their preferred leaders and the public representatives, political parties and the election candidates in Sri Lanka will have to take a vested interest in the status of the migrant workers. They will be compelled to address the issues of the migrant workers. On the other hand if migrant workers become empowered voters they will have an opportunity to intervene in the making of state policies concerning their rights. Apart from being entitled to their rights as workers, migrant workers will be able to ensure exercising their democratic right to choose preferred public representative. This will in turn guarantee migrant workers’ community the entitled participatory capacity in national policy making as well. In order to facilitate the voting rights of migrant workers working abroad or within the country relevant laws could be introduced. It is our belief that electoral laws can be amended to facilitate these migrant workers to vote from the country or local area they live in. In this context, similar to the practice of other countries, postal votes or specific voting method could be used for this purpose. Sri Lankan embassies in the particular countries can be temporarily turned to polling booths for the migrant workers to use. Certain challenges inevitably could be expected in launching these steps. Other countries have already launched such processes and it could be useful for Sri Lanka to look at these best practices. We from the ACTFORM network request to establish laws to grant voting rights to the migrant workers and take steps to set up practical and formal mechanism to implement the laws. This will ensure the basic democratic right of the migrant workers as well as the leaders selected to govern the country will also be compelled to look into the migrant issues. In the present context of the nation preparing for the presidential election, we would like to request from the state policy makers and all the political parties, to commit to the protection of voting rights of over a million migrant workers, in complying with the international obligations; to facilitate migrant workers to exercise their vote in the country/local are they are working at the moment; to ensure migrant workers voting rights. 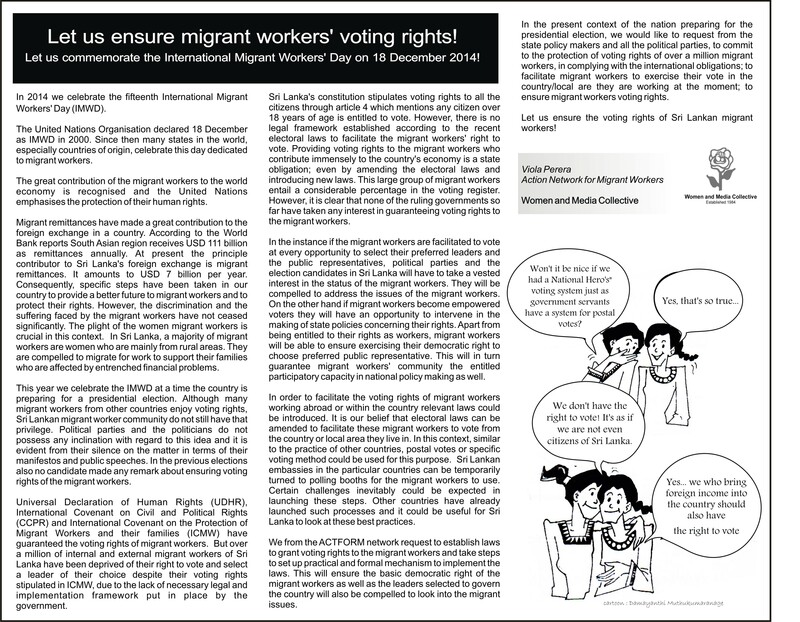 Let us ensure the voting rights of Sri Lankan migrant workers!